I do not like snakes and this one appears to be growing in population. Don't have any idea why people buy these things for pets and then let them go. Scary if you live in Fla.
As bad as the recent cold spell was in south Florida, it may have a good side. These snakes are tropical and can�t take long period of cold temperatures. We can only hope that the numbers have been significantly reduced by the record breaking lows of the past week. We only have ourselves to blame, as humans always messing with the natural order of things & wanting so much control by having wild things as pets & this is the end result. Not the snakes fault. This is a serious problem in Florida. I think it is more than high time to start passing bills that forbid the bringing in to this Country exotic animals that do not belong here. People are allowed to buy these just because they have the money, not necessarily because they have the knowledge how to take care of them. You want one of these animals so badly, go to where they live and live among them. A very huge problem in Florida that needs to be addressed ! I cant believe the irresponible pet owners who have bought these snakes and then tired of them and let them loose. we need stricter laws to not allow exotic pets into our country. why would anyone want a python for a pet to begin with? I admire snakes, they are not nasty & slimy but fascinating. However, they belong in their native countries and not in anybody's care unless licened, such as a zoo or a specialist rescue. Alien species can cause terrible devastation and trying to introduce a predator can have an even worse effect. With these snakes, even though the weather is cold, as they are so large that it is possible that they can cope with the cold. I adore snakes. Wild ones who get this big NEVER belonged in captivity. It is our fault as humans for doing this to them. I feel sorry for the snakes, honestly. They will be hunted down and killed although they certainly did not board planes on their own to get here. I could not see any actual picture of the snake but just talking about them makes me shiver. this is a serious problem in the south in general - just like with those giant wild pigs. this is what happens when these exotics that are not native to our nations are transported in from others. we must do everything possible to stop exotic imports of animals. let's hope the big freeze the south has received recently hasn't damaged the orange groves in vain - let's hope it also wreaks some havoc on the thriving of these exotic predators. Poor snakes are not there by any design of their own. 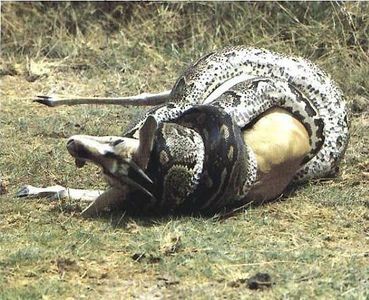 I hate seeing the big ones killed (or any killed), just because they are snakes. They are beautiful and not at all slimy. Since there are so many of them in the Everglades, I seriously doubt they can be eliminated! So although I don't like the idea of hunting, I believe we should declare an open season on them and put a bounty on each skin. I was shocked to hear that while they were trying to get rid of these monster snakes, pet stores were still selling them. Maybea law should be passed against the sale, import or ownership of any non-native snake! I'd so get myself killed, I don't like snakes but I adore animals. I'd be beating on that snake trying to save that wait, that's not a deer. Is that pic from Florida? I wouldn't like being anywhere near snakes that BIG. No way ! The biggest problem in Florida is Floridians. Unfortunately the snake illustrated is not devouring one of them. Letting invasive snakes loose, running over rare leopards and key deer, smashing manatees with boats, they need their population of Homo doofus substantially reduced. the snake problem is out of control, my thanks to the brave people for capturing those snakes....but can the 2 different species interbreed? This is what happens when we humans mess around too much with the natural order. Let us hope that the recent cold snap killed off most of the invasive pythons! this is not just an issue of exotic pets - I seem to recall reading an article recently about what feral cats have done to displace other natural predators, and the common house cat is hardly exotic! ..and there are exotic pet owners who do properly care for their animals (I'm friends with one, who does own snakes, albeit much smaller varieties - and he would never abandon them! ...though I'm in NH where winter would kill them pretty quick). but regardless of how irresponsible and horrible their actions were, these people have already abandoned their animals and the problem is already here and must be dealt with in some way. ...but once a foreign creature has started to thrive in an area, before you just kill them off you have to also consider what will happen to populations of what they are preying upon when a predator is removed from the environment. I mentioned an article about feral cats in austrailia - they killed a bunch of feral cats and then the rabbit and rodent populations exploded in that area and the pictures presented in the article implied that these 'prey' type animals now that their populations were not held in check devoured local foliage, etc. ...so while this is an issue FL needs to deal with, it needs to be done carefully and in a supervised manner, in my opinion. when it comes to dealing with it, let's be the responsible ones here - even if the people who created the problem were not. Todays conundrum; what if a wild population of pythons is the only thing capable of keeping the feral hogs under control? We know the damage they cause. I'm glad I don't live in Florida. It makes me angry that people are so irresponsible with these pets that are illegal. Then they just get abandoned. This is all secondary to the desire of people to act without thinking when their "I Want That" center in the brain is stimulated. Eventually followed by the cowardly "I can't handle this creature and don't want to be bother finding a responsible way of getting rid of it," feeling. People and wild things are not supposed to live in very close proximity with one another. You can't OWN a wild thing. Many people take them prisoner, and this is the result. Not all of the exotics are the result of irresponsible owners setting them free, many exotics have escaped due to hurricanes destroying warehouses where they were kept by importers; specifically Hurricane Andrew in 1992. Needless to say, I am not an advocate of the 'average Joe/Jane' keeping an exotic which has the potential of colonising the environment if set free; either intentionally or not. Yesterday, I was reading the newspaper from my home county (Palm Beach), which stated that since the cold spell Florida has recently experienced, 11 large snakes have been caught, at least 1 of them being 14 feet! The article went on to say the recent temps have had an impact upon not only exotics, but native species as well. Most notably sea turtles and manatees and it has been caring Floridians who have laboured to help these irreplaceable creatures. Therefore showing not all of Fla's population is concerned with their personal pleasures at the expense of the animal kingdom.